Note that around the exact time of this article’s publication, FusionInvoice 2 was released as commercial software, and is based on Laravel instead of CodeIgniter like previous versions. It is, for all intents and purposes, a completely different application. This article focuses on the older but still fully functional version 1.3.4. As a freelancer or a small business your time is better spent creating that next big project or meeting the client’s requirements than keeping track of invoices. FusionInvoice is an open-source, self-hosted invoicing web application built for freelancers and small businesses. Although there are quite a few free online invoicing applications, none of them give you the privacy or the flexibility which FusionInvoice provides. Client management, dashboard and reports, recurring invoicing and invoice history are just few of its features. FusionInvoice being an Open-Source project means that you can always change or add to its functionality as you need it or even install it on a private system, thus limiting the number of users who have access to your sensitive data. Although the application is Open-Source, the developers considered that the community can better help the project by only providing their input and suggestions for features and enhancements they, as a community, would like to see in the project, but development should stay a closed team effort. This may seem like a strange approach to open source a project, but it looks like it lets the team focus on keeping a constant pace in developing new features and bug fixing. Let’s check if your system meets these requirements. If the MySQL server is properly installed and running, you should now see an output similar to the one below. Depending on your server setup the version numbers might be different but the output should be similar. Ok, since the requirements on this VM are met let’s proceed to the next section. Note: I am assuming that you are on a *nix platform (if on Windows, please use Vagrant to set up a working environment), and are using the default Apache/Nginx configuration and have /var/www as your base document root folder. Otherwise, change the path to the one you’re using. You can download version 1.3.4 from Github. After you do, unzip it into your websites folder (www as mentioned above). 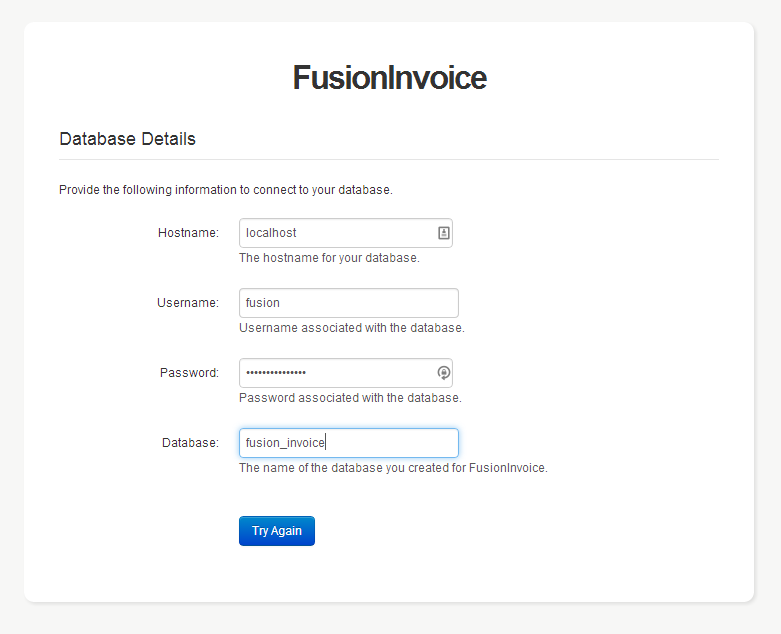 Now we need to create a database where FusionInvoice would store its data. There are two ways to do this, command line or phpMyAdmin. 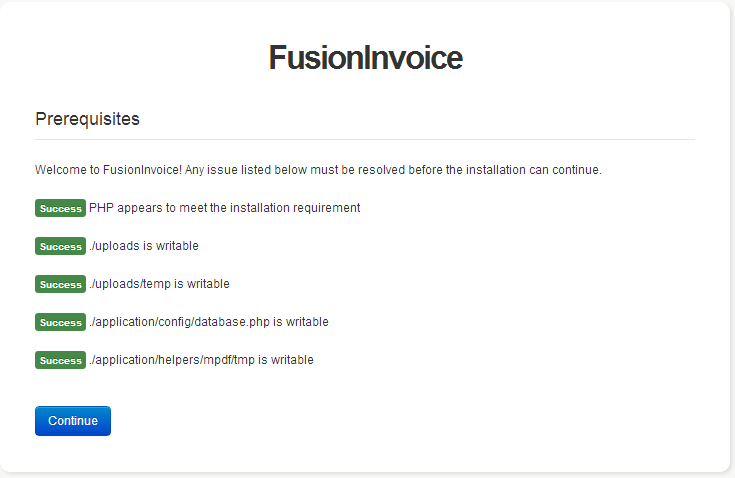 I personally recommend the command line if you are installing FusionInvoice on a production or world available server. 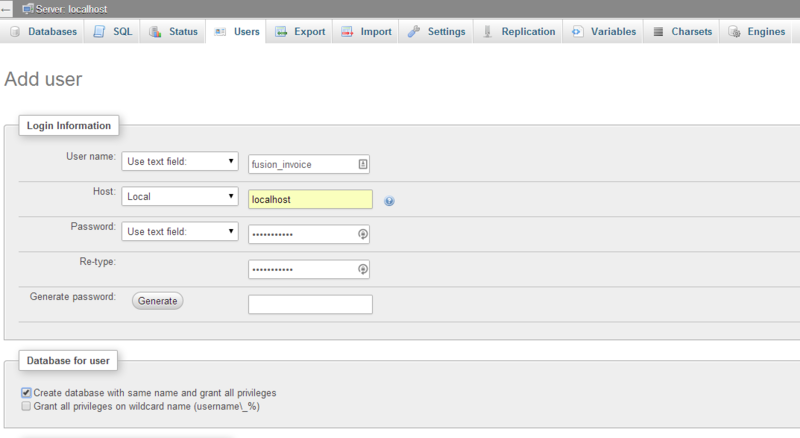 b) Using phpMyAdmin, go to the USERS tab and select Add user. In the new user form fill-in all the fields and make sure you check the Create database with same name and grant all privileges checkbox and phpMyAdmin will create the database for you. **Note: Please make sure to take ALL necessary security precautions and adjust the new user’s permissions accordingly if you are installing the FusionInvoice application on world available server. That’s it! 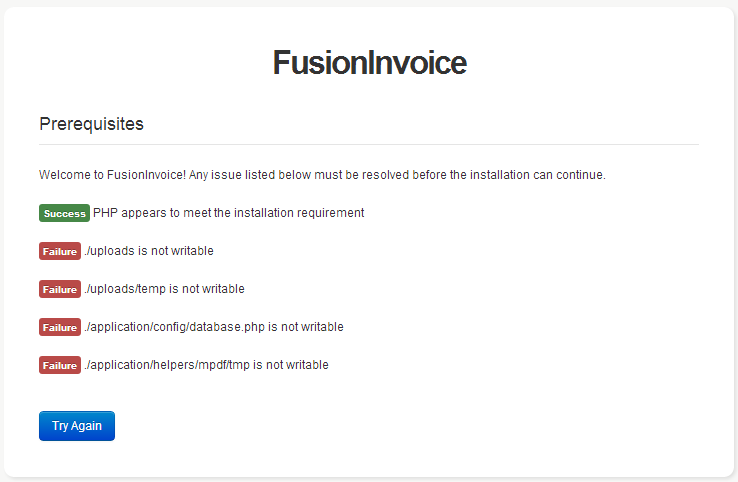 We are now ready to run the FusionInvoice setup module. **Note: Depending on your server configuration the URL might be a bit different. The idea is that you need to send all your requests that do not map to a physical file to index.php in order to start the FusionInvoice application. If you do not know how to create a virtual host or redirect your requests to index.php you can find an optional step at the end of the article that will guide through this exact process. In step 2, the FusionInvoice setup system is providing us with a list of files and folders which are required to be writable. If you refresh the page you should now see all the prerequisites to be properly set up. In step 3 we have to provide FusionInvoice with the database server connection details. If the connection is successful in the next 2 pages FusionInvoice will let you know that the database tables have been properly installed and upgraded. 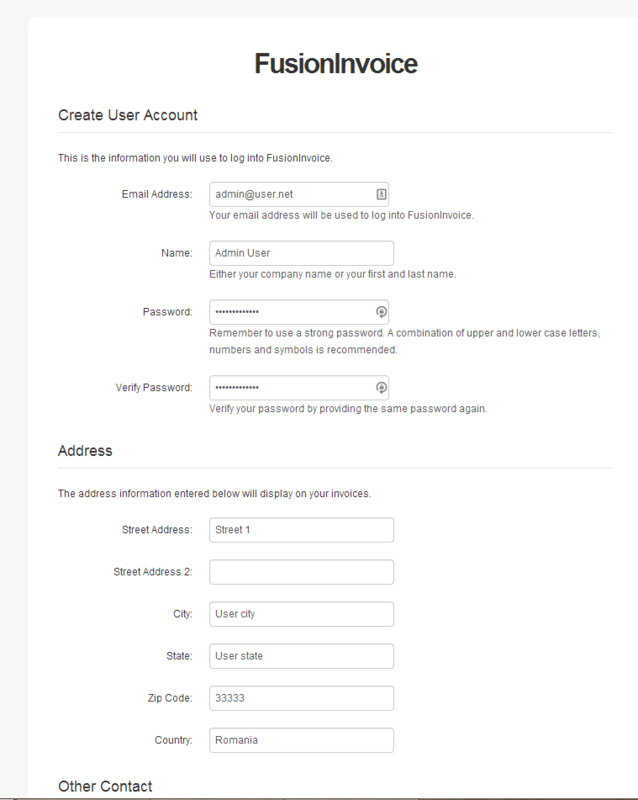 Arriving at the last step you will be asked to create a base user, an administrator account. Once this step is finished you will have successfully installed FusionInvoice on your system. This optional step will guide you through the process of creating a basic virtual host on Apache or Nginx. **Important note: Although many of the virtual host settings that are presented in this article are used also in production they are only a starting point and in no way should they be considered sufficient, from a security perspective, for a production server. Please make sure you’ve taken all the necessary precautions to secure your server. That is all. You can now use your new URL, fusion.invoice.dev, instead of localhost or the VM’s IP address. Now that we created the config, on *nix systems you need to create a symbolic link from the file’s current location into /etc/nginx/sites-enabled folder in order for Nginx to load the new virtual-host. Again, alter all paths to match yours. Now, let’s restart the Nginx server to load our new virtual-host config. If all went well you should now be able to access your new virtual host using the server name instead of the machine’s IP address or localhost. Now that we have created a virtual host let’s also remove the index.php from the URL and have some nice, easy to remember URLs. Now just delete the index.php value and save the file. The abundance of features, the relatively low level of technical knowledge required to set up and manage the application along with an active community ready to help, make FusionInvoice a great tool for any freelancer or small-business owner who wants to spend the time on the project rather then on tracking invoices. Denis is a Zend certified PHP Developer from Romania. He loves programming and playing with new technologies. In his spare time he likes to share his knowledge with other IT lovers and less tech-savvy people.